OMG! love this! Anyway to integrate some kind of notification of new posts? That would be over the top! New Posts ; I put every bandAmp RSS feed address that I could find into the RSS button/dropdown list. And resent posts / blogs are linked to through the 'Site' button. It now got a Network menu with links to any external bandAmp related sites...bandamp youtube channel, emergency forum and bandamp on facebook. I've also added a few more custom search functions, if you click the dropdown GO button to choose your search mode you can now also search KVRAudios vst database for vsts and you can send your query to Rhymer.com. I personally like the custom search functions and I'd like to build in a few more. So any suggestions and ideas are welcome.....more external bandamp concerns? 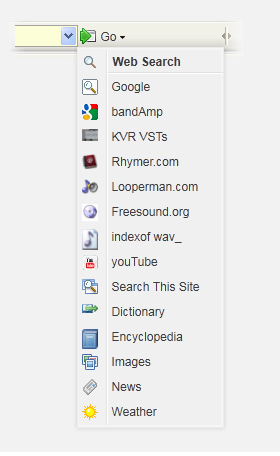 custom searches of The FreeSoundProject.org, accappellas4u.com and Looperman.com ??? It is a VERY handy toolbar, I tend to take the radio away in preferences and have the weather up there. and you can set it up to take any highlighted text on a page and make any one of many searches with that text, and it's connected to bandAmp in nearly every way...you just cant automatically login with it! If any one reading this can think of other popular and / or appropriate site searches to add to the menu please say so.